Formerly a Curator of Photography at the Art Institute of Chicago and Director of the California Museum of Photography at the University of California, Riverside, Colin Westerbeck has also taught the history of photography at the University of Southern California and, currently, UCLA. He is internationally acknowledged as the foremost expert on street photography. Joel Meyerowitz started making spontaneous color photographs on the streets of New York in 1962 with friends such as Tony Ray-Jones and Garry Winogrand. He has since become known as one of the most important street photographers of his generation. Instrumental in changing attitudes towards color photography in the 1970s, he is known as a pioneer, an important innovator, and a highly influential teacher. 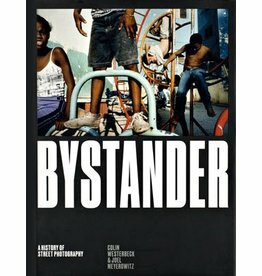 New and updated edition of Bystander, an unsurpassed history of street photography by one of its heroes, Joel Meyerowitz, and noted critic Colin Westerbeck.